Due to other travel we hadn’t been to the Sierra since 2013 and we missed our wonderful local mountains. Following our thru-hike of the Colorado Trail in July 2016, we craved spending time in our favorite range of mountains. We also wanted to explore some off-trail possibilities in the vicinity of Mt. 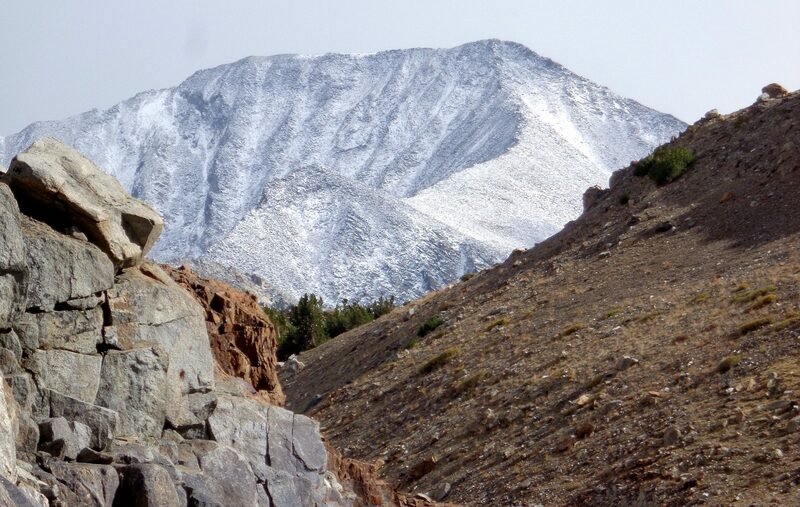 Baxter to help our friend Alan Dixon improve his Southern Sierra High Route (SSHR). 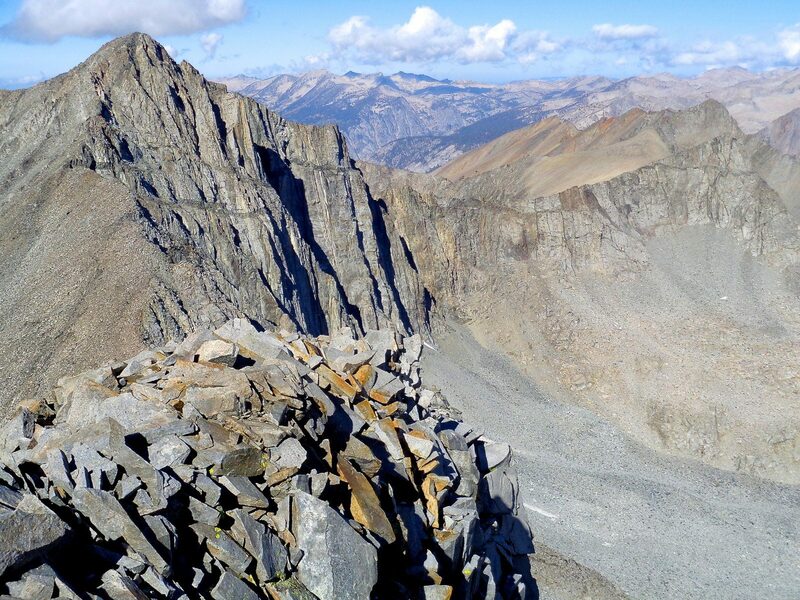 We found a backpacking route that connected the two basins blocked by the Baxter/Acrodectes ridge. Every day is a five star day in this range of mountains. I especially like the basins between about 10600 and 12000 feet, where there are beautiful meadows, lakes, and scattered trees. 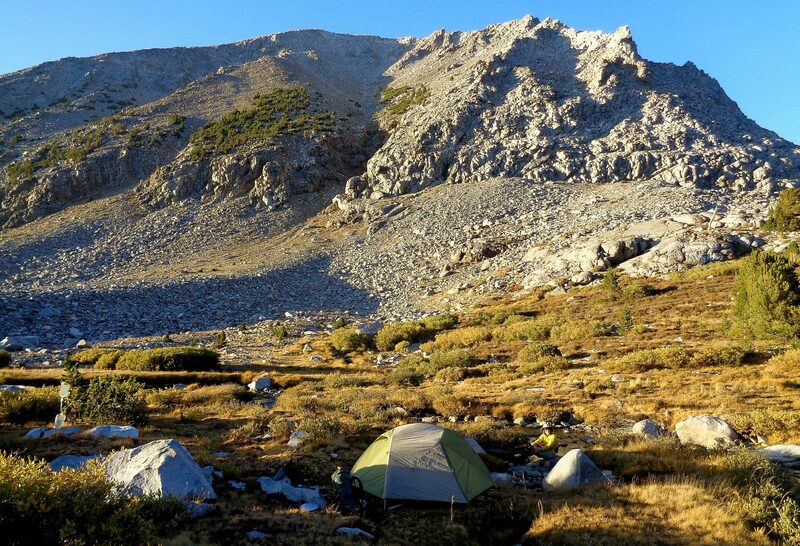 I loved the campsite at 11700 feet just west of Marjorie Lake, and another at 10800 feet in 60 Lakes Basin. Cross-country travel through the high basins is sublime; for me the cross-country travel across boulder fields and talus is not as much fun, but is necessary to reach new areas. Great walk. We had never crossed Baxter Pass before, so we got to visit some interesting new territory. 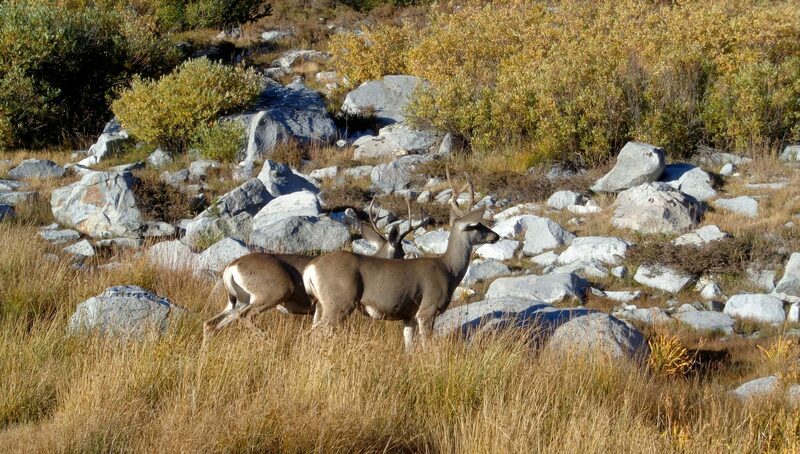 As usual, we ran into nobody when we were off-trail; if you don’t like the crowds on the JMT, leave it. The unnamed lake directly below Window Peak is as nice as any I have seen in the Sierra. 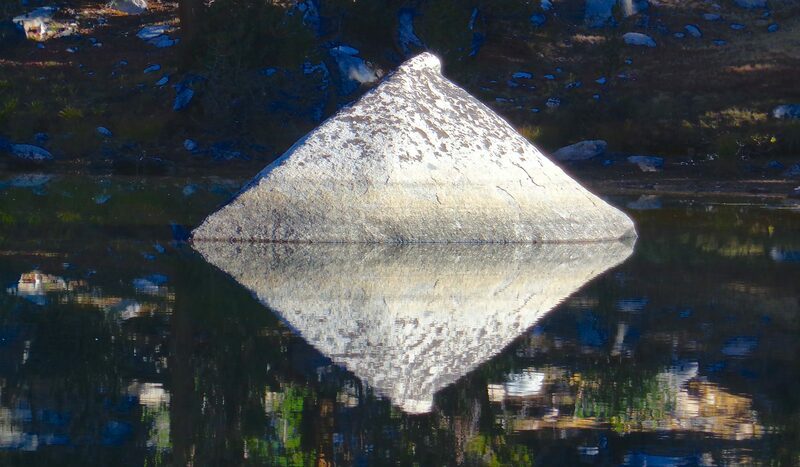 This was our fourth visit to Sixty Lakes Basin and we still found it a peaceful and striking place. The south ridge of Mt. Cotter was a fine and fun ascent. A few weeks previously, we had completed a thru-hike of the Colorado Trail. 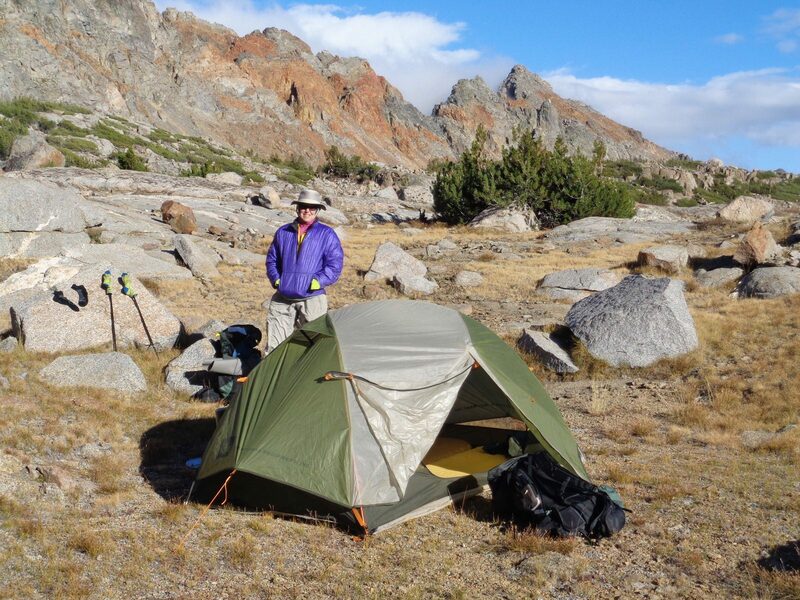 For me, the Baxter trip confirmed that the southern Sierra Nevada is by far the best range of mountains for backpacking. 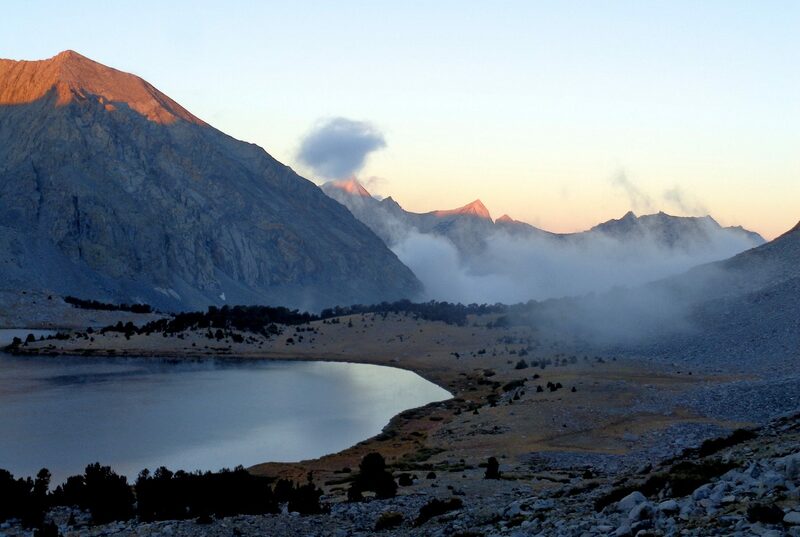 The Sierra feels wilder, the peaks and lakes are more beautiful, and the travel is more rewarding. Alan Dixon’s website has detailed information about the SSHR. Previously Alan had not found a cross-country route between between Pinchot Pass and Glen Pass, and one reason for our trip was to scout the area for a route. We wrote detailed directions for our cross-country route between Pinchot Pass and Glen Pass and Alan has integrated these directions for southbound travel on the SSHR. 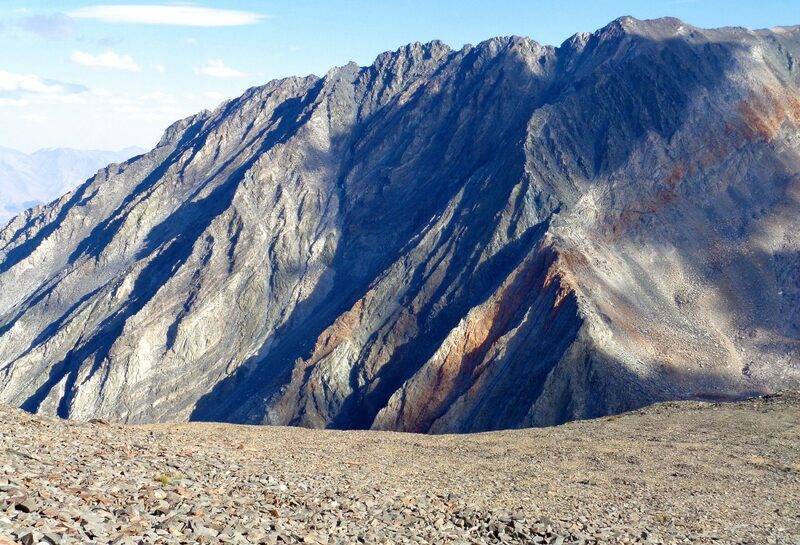 This report describes a northbound ascent of Baxter. The route that traverses Mt. Baxter should not be attempted unless you have previous cross-country experience. The hike starts at the east side Baxter Pass Trailhead. Follow the old trail across the pass and down to the Baxter Lakes. Leave the lakes and ascend the southwest slope of Mt. Baxter to its summit. Slightly west of the summit and slightly below it is the top of a short steep chute leading onto Baxter’s north ridge. Descend the chute to the ridge. 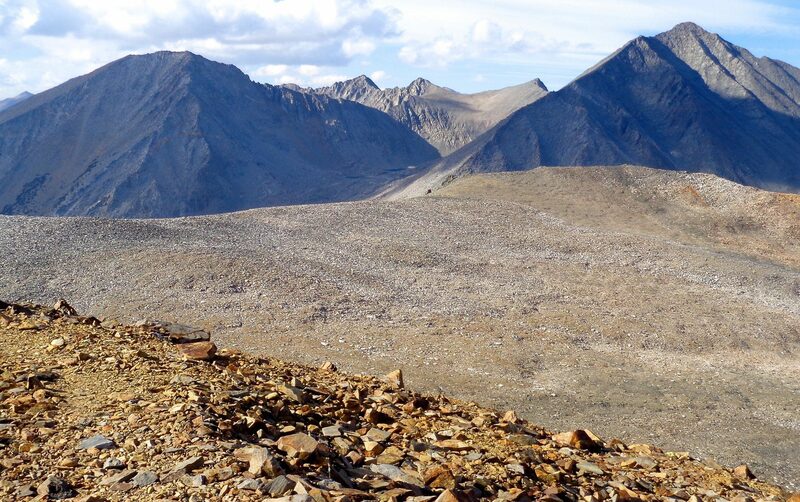 Follow the blocky ridge down to the major saddle well above and east of the south end of Stocking Lake. Leave the ridge and descend in a northwesterly direction to a large chute that shows as a distinct notch on the USGS map just west of the letter “O” in the words FRESNO CO. The chute is steep and loose, but passable. Descend and exit the chute and head north and pick your way down the easy ramps well above Stocking Lake. Don’t drop to Stocking; aim for its outlet stream just above where it enters Lake 3331. Cross the stream and work your way north near the left shore of the lake and down to the old and indistinct Sawyer Pass Trail. Head up to the notch between Mount Cedric Wright and Colosseum Mountain. 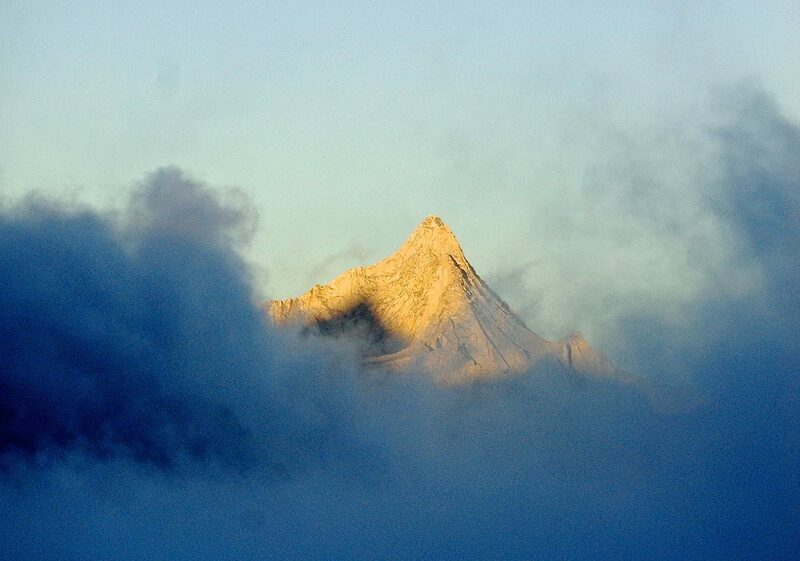 Both peaks can be climbed from this notch. 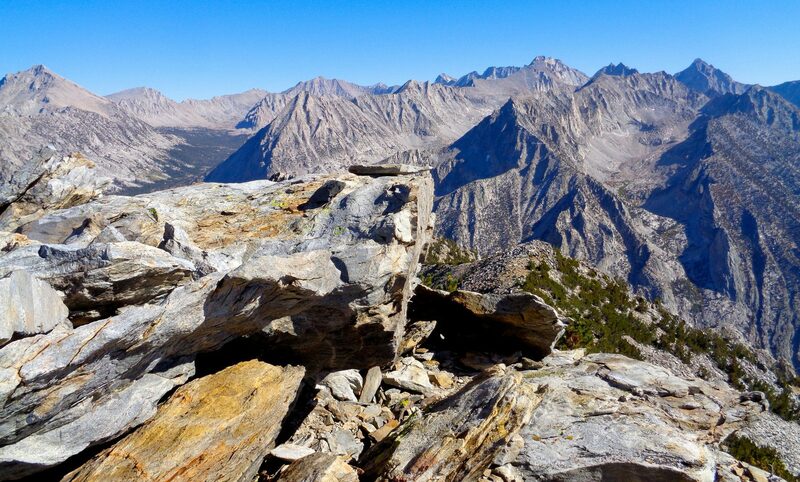 From the notch, descend and work your way cross-country to the big lake southwest of Mt. Perkins. 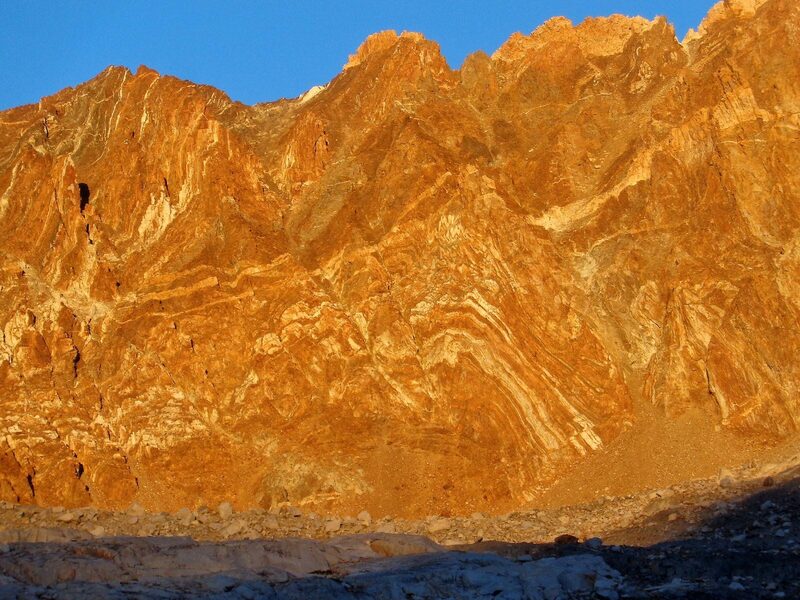 From north end of the lake, Perkins can be climbed via the long and somewhat tedious scree slope on its west side. 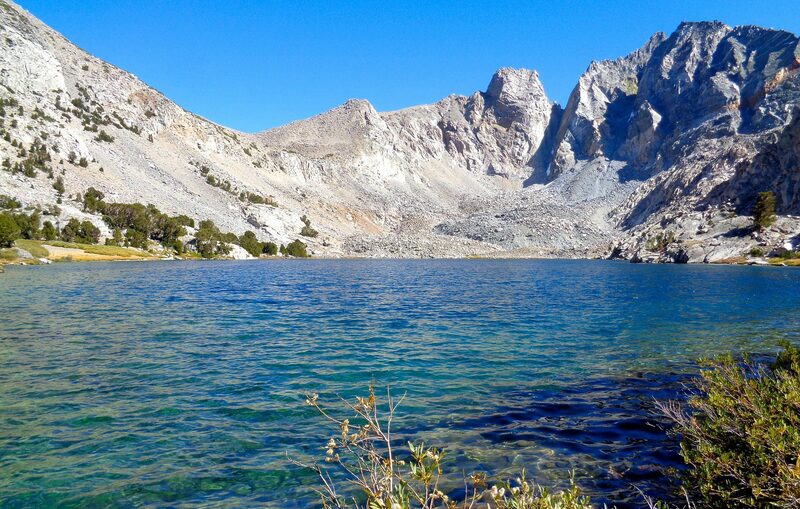 Leave the lake and walk through the beautiful basin towards Pinchot Pass. 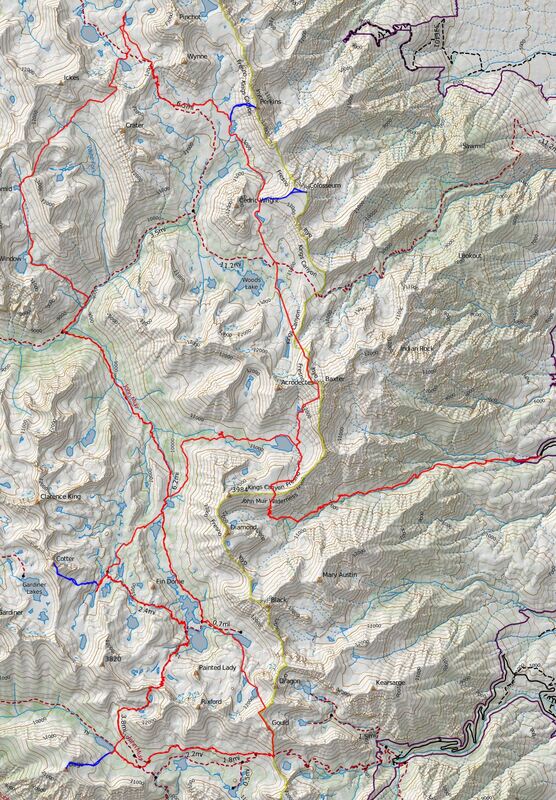 The USGS map shows the old JMT running through the basin, but the trail has been moved upslope to the west. 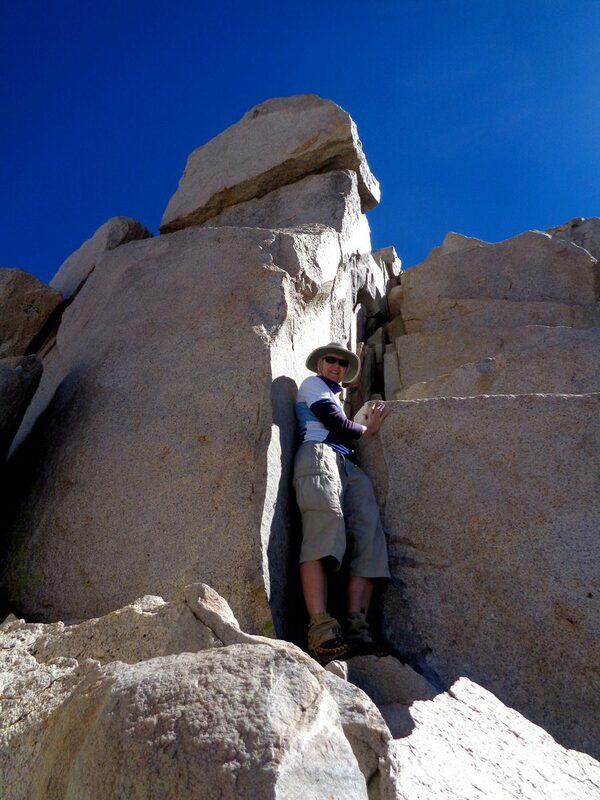 Eventually gain the JMT and cross Pinchot Pass. From Pinchot, we continued north cross-country to the large lake directly west of Mt. Pinchot, where there is good camping away from the JMT. 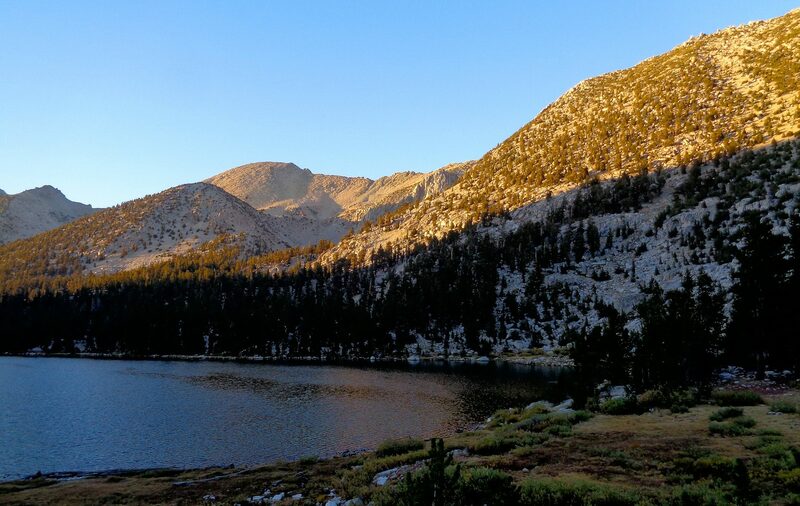 The route actually follows the JMT down to the large lake at 3500. From the lake, climb Crater Pass, the low point at 3720 north of Crater Mountain. Descend from Crater Pass across the open basin at the north end of the White Fork. Stay high and aim for the cluster of small lakes at 3470. Climb to the small shoulder at 3630 south of the lakes. Contour across the slopes southwest of the shoulder to Whitefork Saddle at 3600. The walking is very east much of the way, but the last third entails crossing very large boulders. 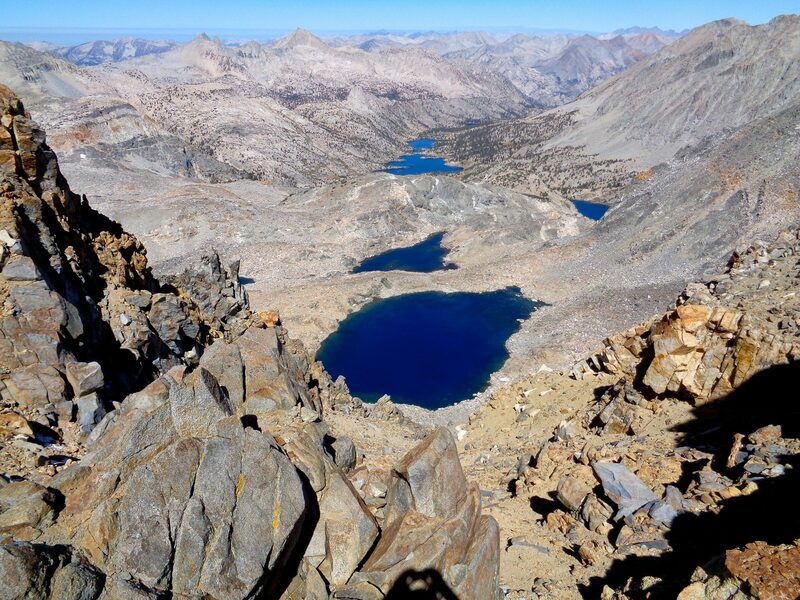 Once at the Saddle, descend to the first large lake and then down the canyon, following the stream out to the JMT. 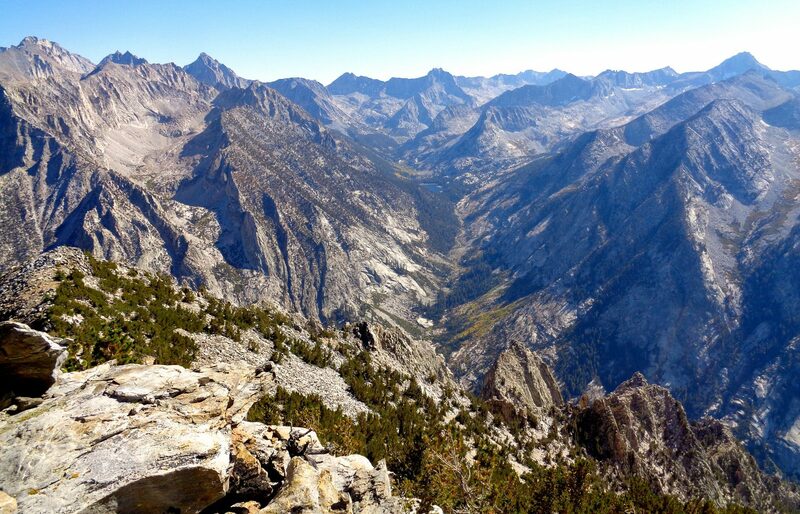 Walk south on the JMT and continue across the bridge over Wood’s Creek. After a few miles, you reach Dollar Lake. Between it and Arrowhead Lake, leave the trail and work your way through convoluted country to Basin Notch. 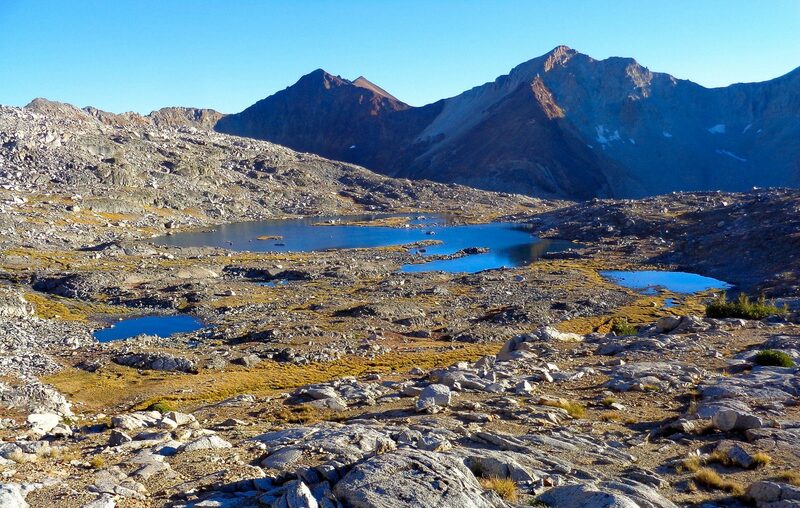 At the top of the Notch, enter 60 Lakes Basin. 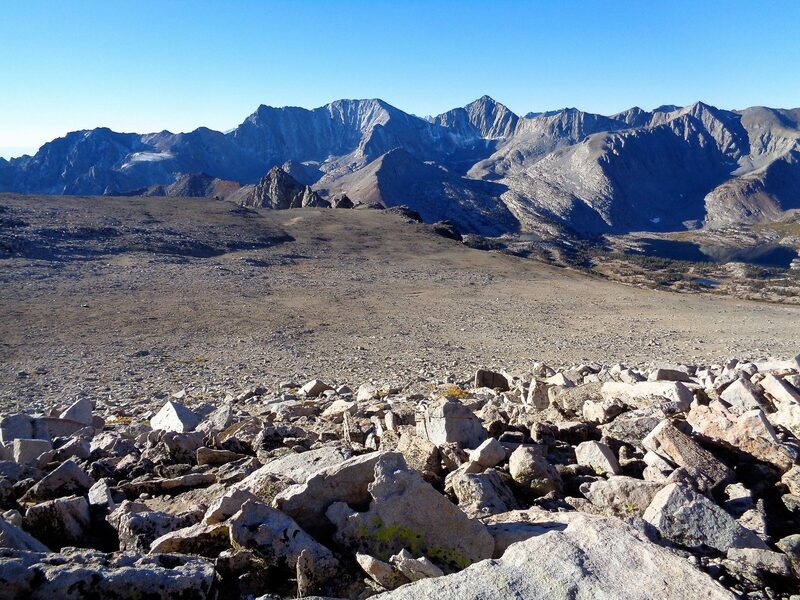 Eventually pick up the trail that crosses the ridge south of Fin Dome and takes you back to the JMT. Mount Cotter is an easy climb from Lake 3304. 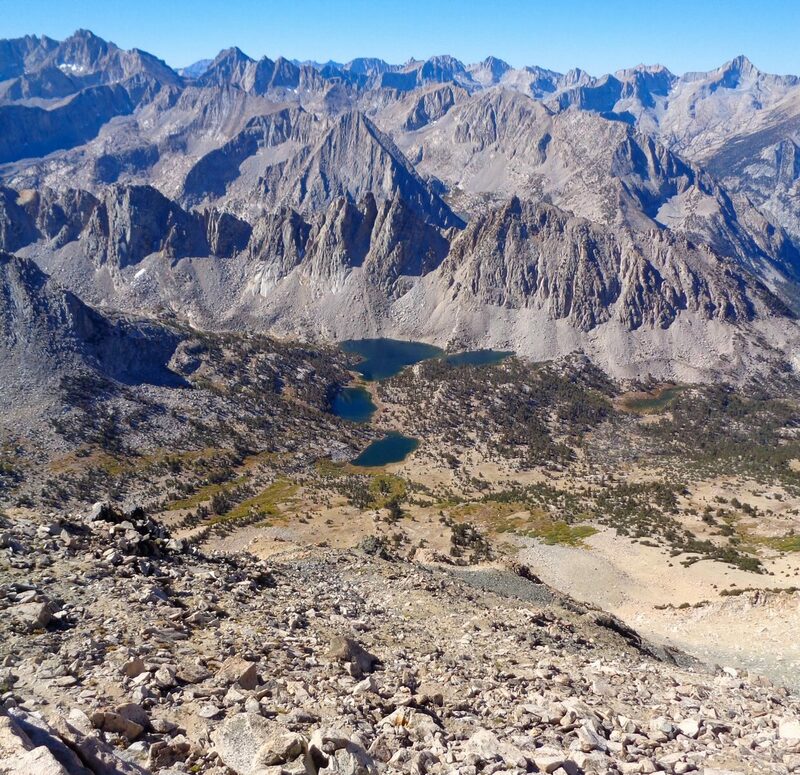 If you want to delay your return to the JMT even longer, continue cross-country south from Lake 3353, cross the notch at 3560 and descend to the JMT just before the switchbacks leading up to Glen Pass. 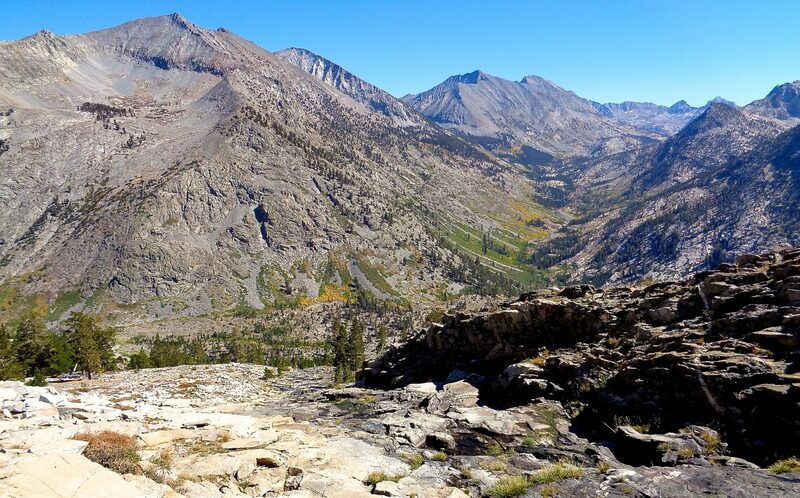 Take the JMT over Glen Pass and eventually join and head east on the Kearsarge Pass Trail. Follow the trail to the pass. Along the way, you drop down to Charlotte Lake and from there climb Mt. Bago. 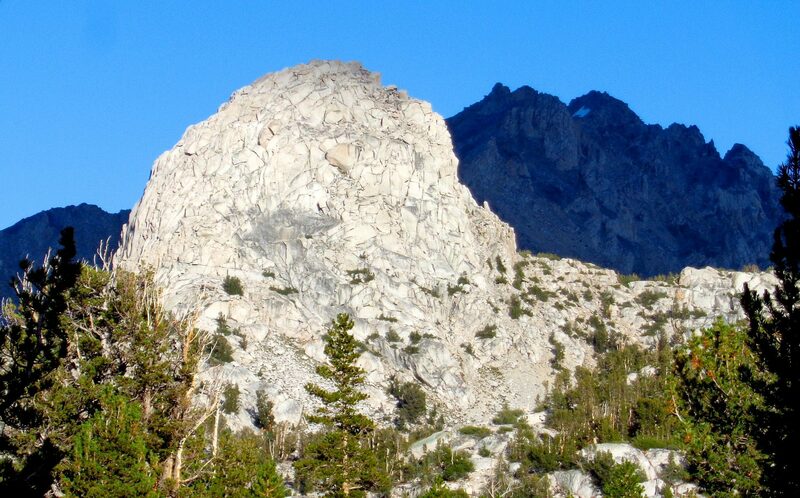 There is a use trail from Kearsarge Pass to the summit blocks of Mt. Gould. 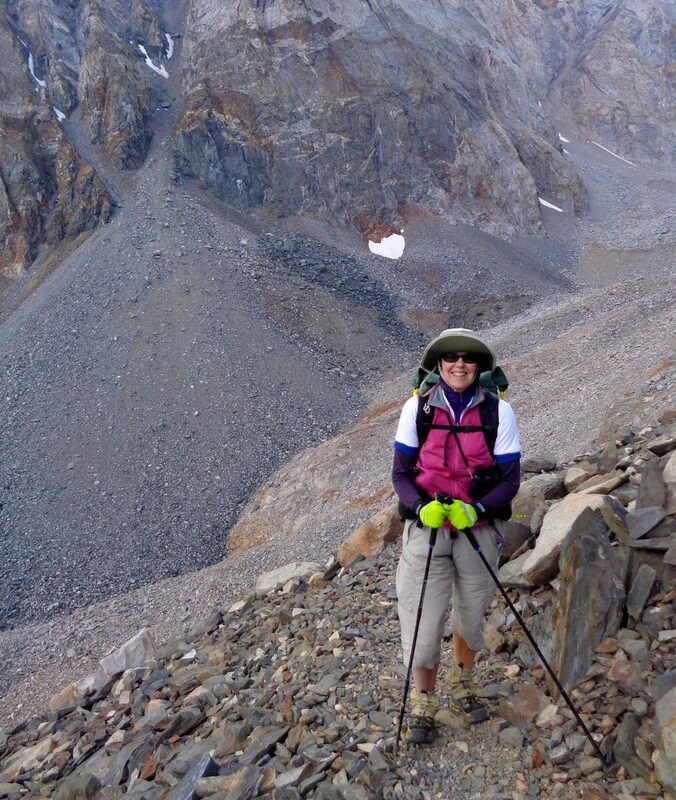 The trail is easy, the last fifty feet or so to the top of the summit blocks is very exposed. 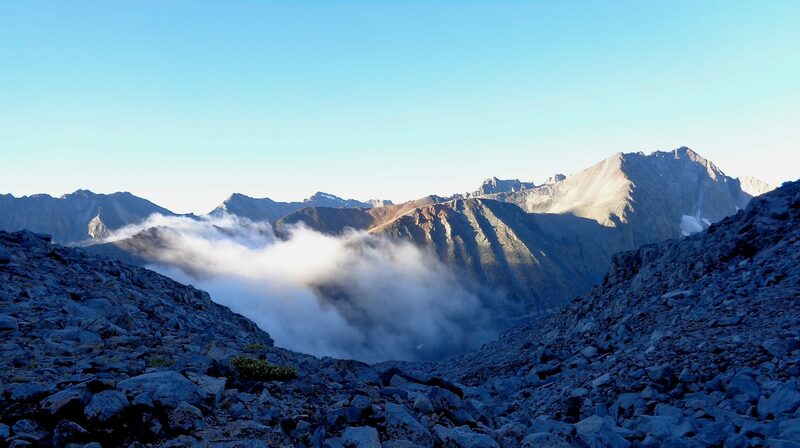 North of Gould, stay as high as you can until you reach Gould Pass. 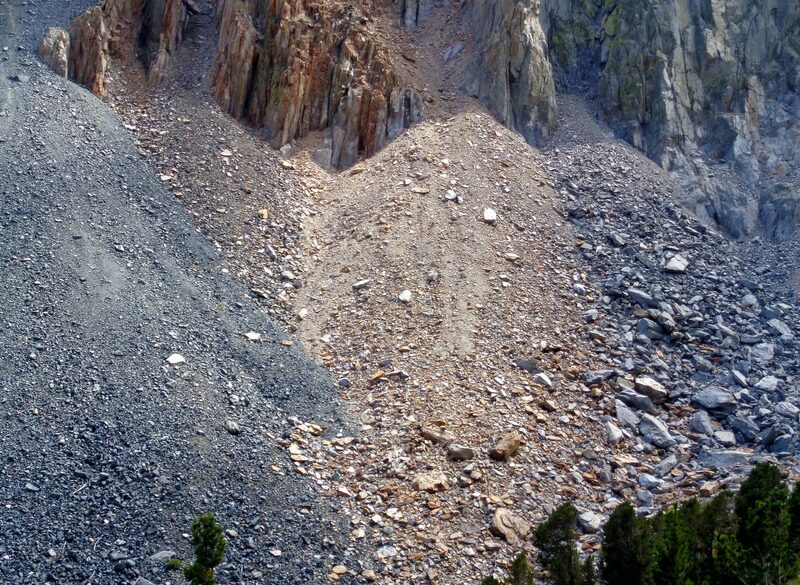 Descend the northwest side of the pass carefully on steep and very loose talus. 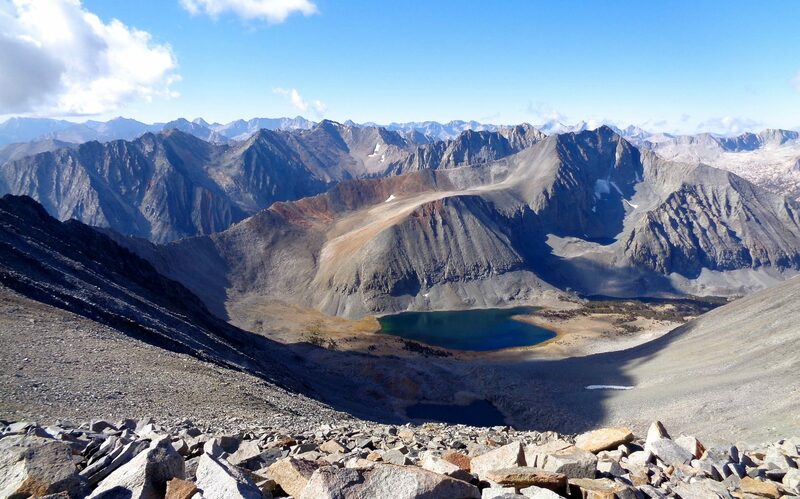 At the base of the pass, work your way north and drop to Dragon Lake. This descent can be done several ways; pick your own route. 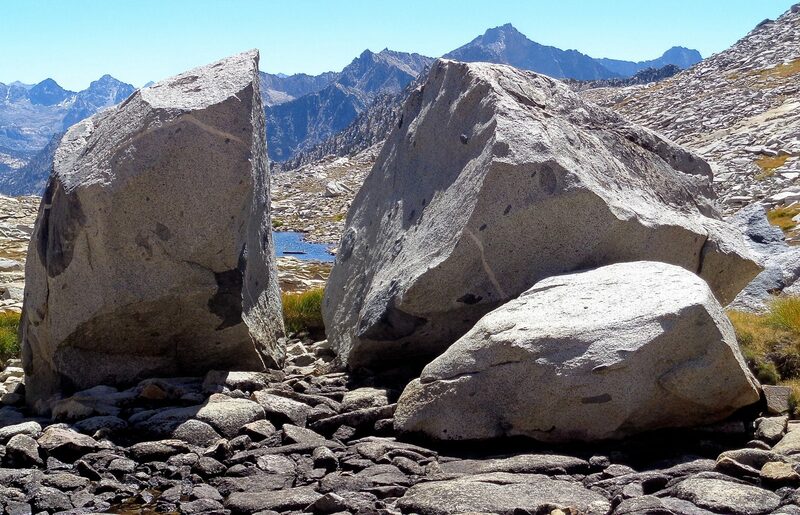 Leave the outlet of Dragon Lake on an old use trail and descend back to the JMT at Rae Lakes. 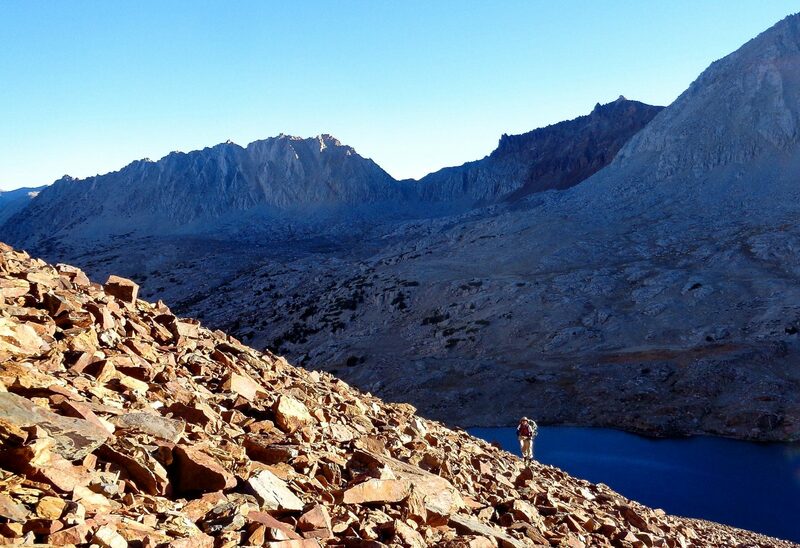 Head north on the JMT back to Dollar Lake. 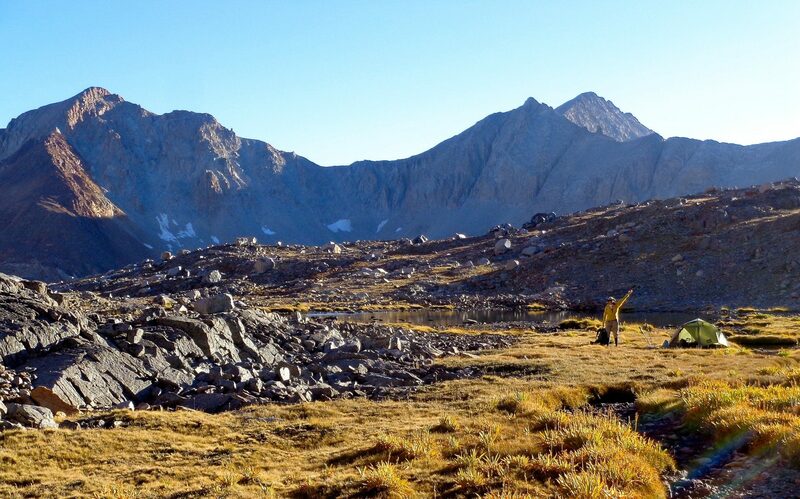 Here you can find the remnants of the old and unmaintained Baxter Pass Trail. Follow the trail as best you can to the largest Baxter Lake, where the trail is a lot more apparent. Take the trail over Baxter Pass and back to the trailhead. 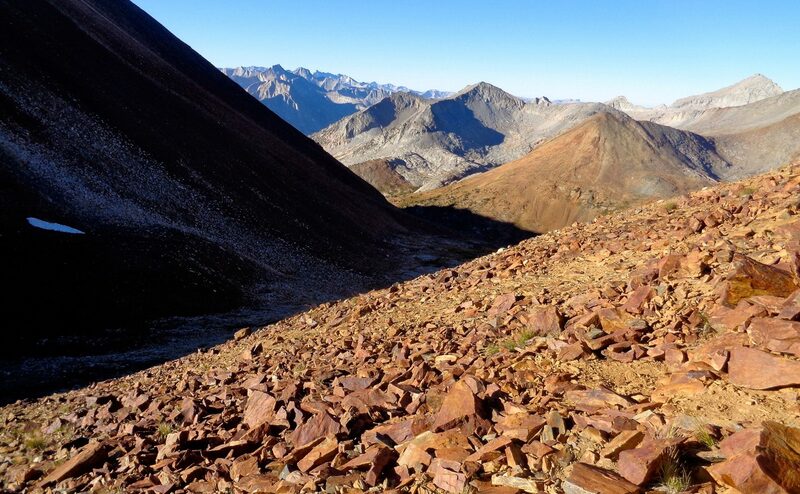 The Baxter Pass Trail is not currently maintained. 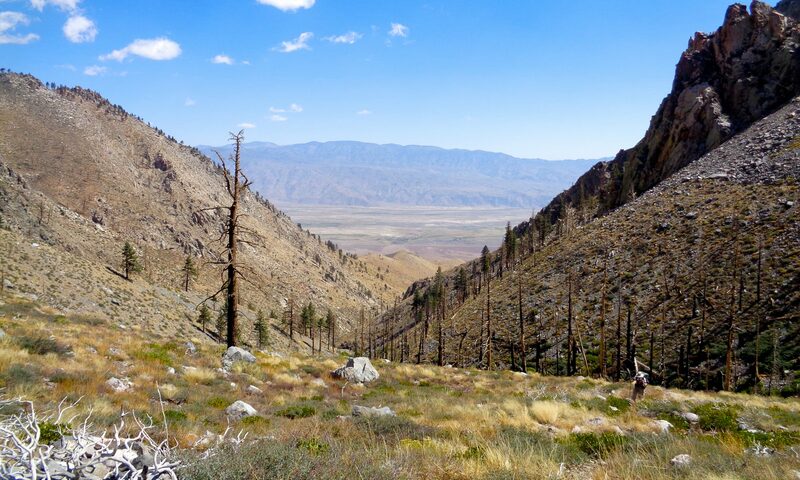 It passes through several miles of a burn zone between the trailhead and about 3400 meters. The trail is actually relatively easy to follow if you have some cross-country travel experience and is only overgrown in a few very short stretches until beyond Baxter Lakes. There were only a few dead trees down across the trail. The west side of the trail between the lower Baxter Lakes and Dollar Lake is obscure in places, but can be followed with care. 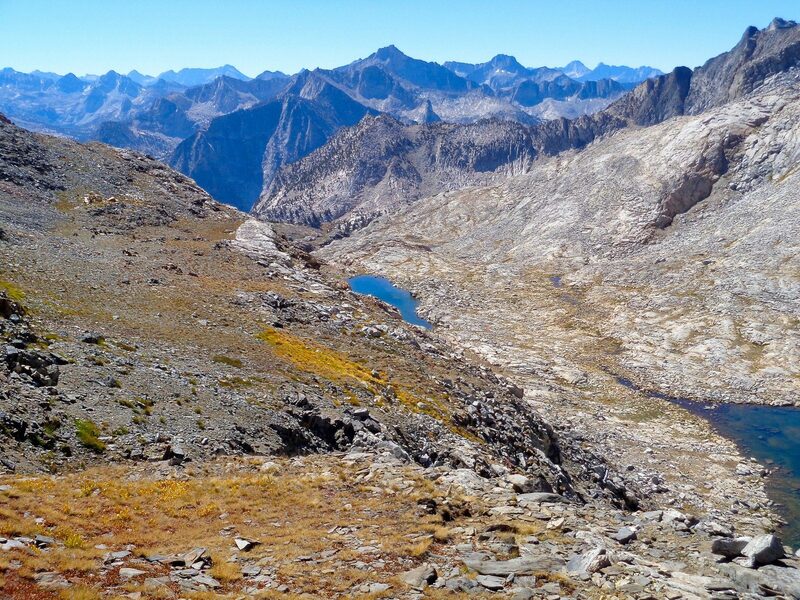 If you lose the trail in this area, just head downhill until you hit the JMT. 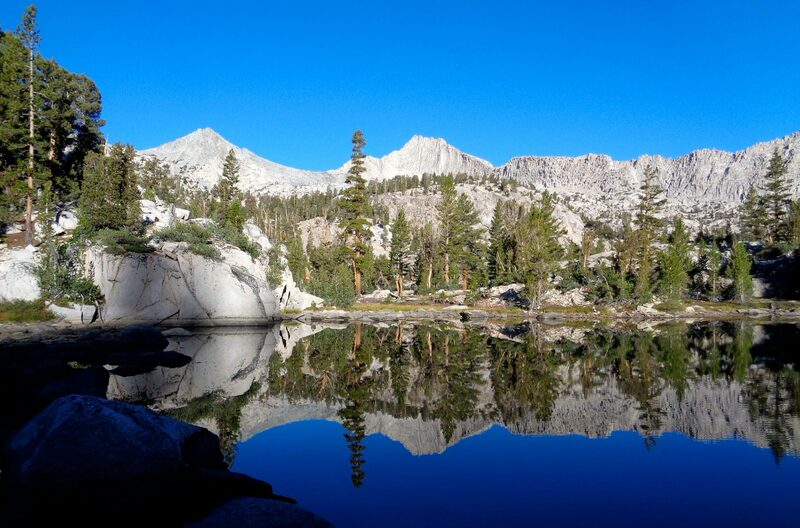 Rae Lakes is one of the most heavily used areas in the southern Sierra. 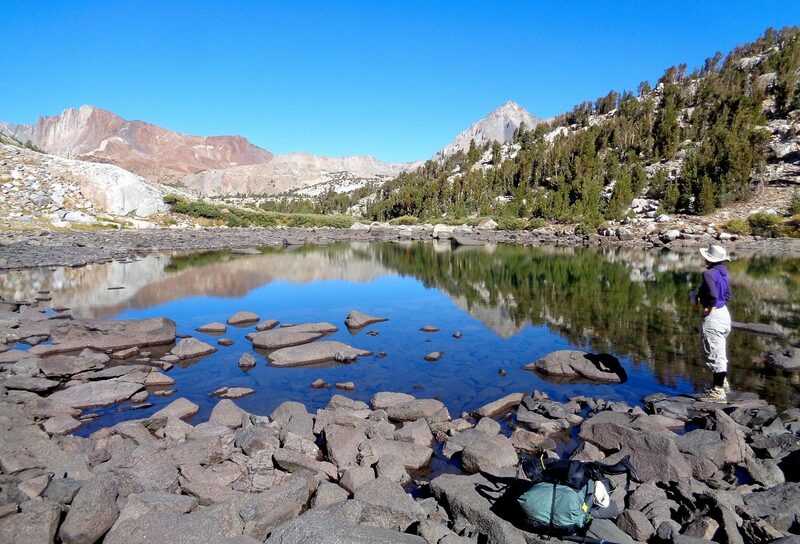 By traveling through the beautiful 60 Lakes Basin, you can avoid the crowds. The cross-country travel in this basin is quite easy. 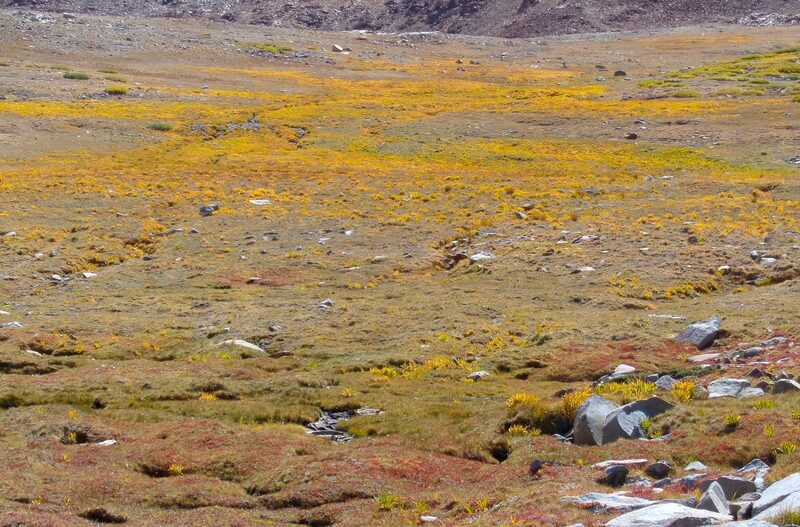 The off-trail section west of the JMT from just north of Pinchot Pass to Wood’s Creek is fabulous. This area is rarely visited. 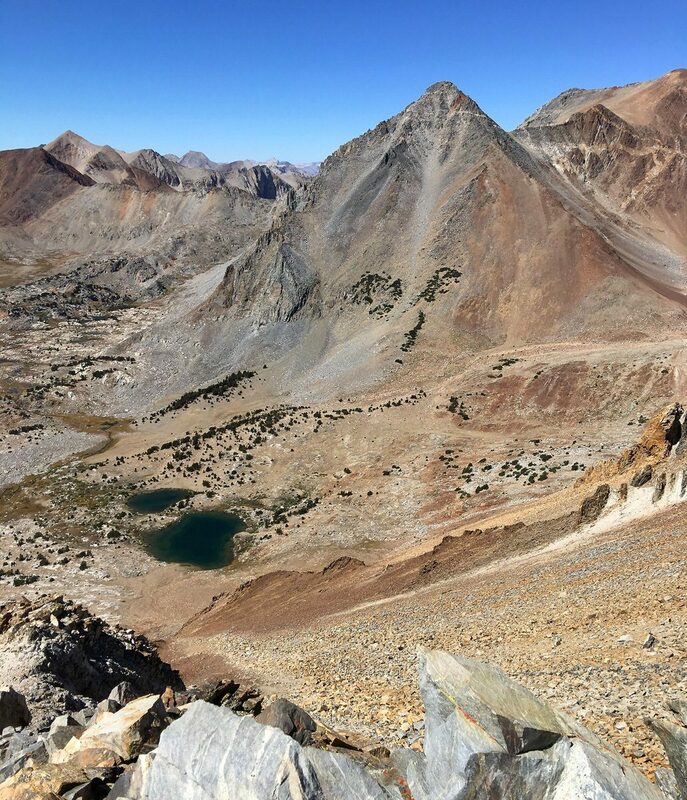 Crater Pass looks intimidating from the JMT, but was an easy 2nd class climb. 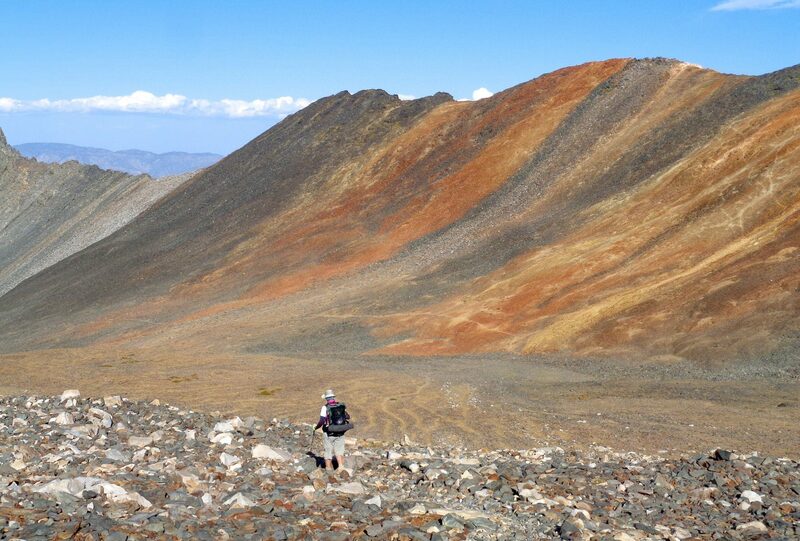 We called the unnamed saddle at 3630 meters between Crater Pass and Whitefork Saddle, Bed Bear Pass. You won’t find this name on the USGS maps or in Secor. The large lake at 3230 below Window Peak is gorgeous. The portion of the route dropping to Wood’s Creek below 3100 meters can get quite steep in a few places, so take care in route finding. You can mostly follow the creek, but it cliffs out a couple of times. 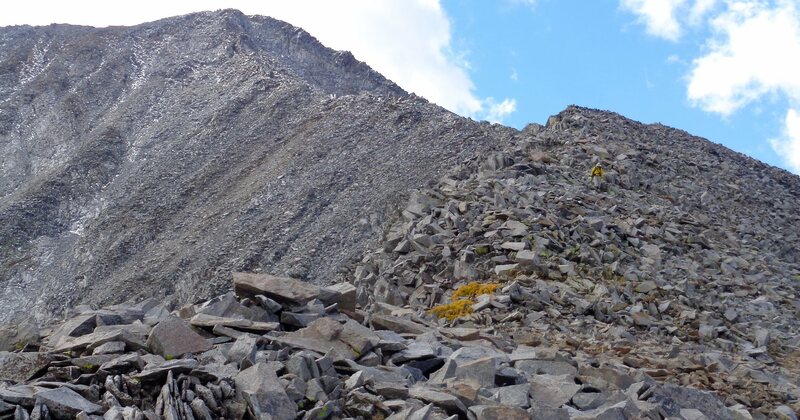 The descent of Gould Pass on the northwest side involves quite loose and tedious talus. Caution is advised. 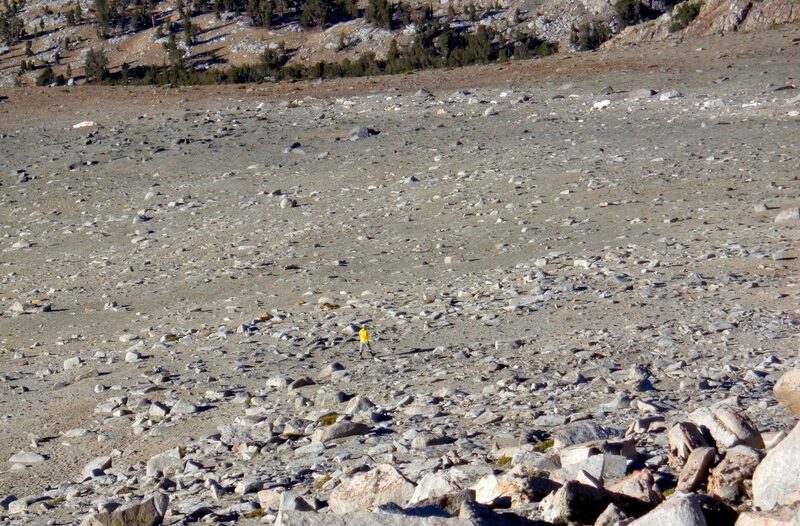 There is a use trail below Dragon Lake that leads to the JMT, but it is not where it is mapped on the USGS quad. We did some SPS peak bagging on this trip. Baxter, Coliseum, Cotter and Gould were easy ascents. Perkins and Mt. Bago were scree slogs, but neither was horrible. The views from Cotter and Colosseum were particularly notable. 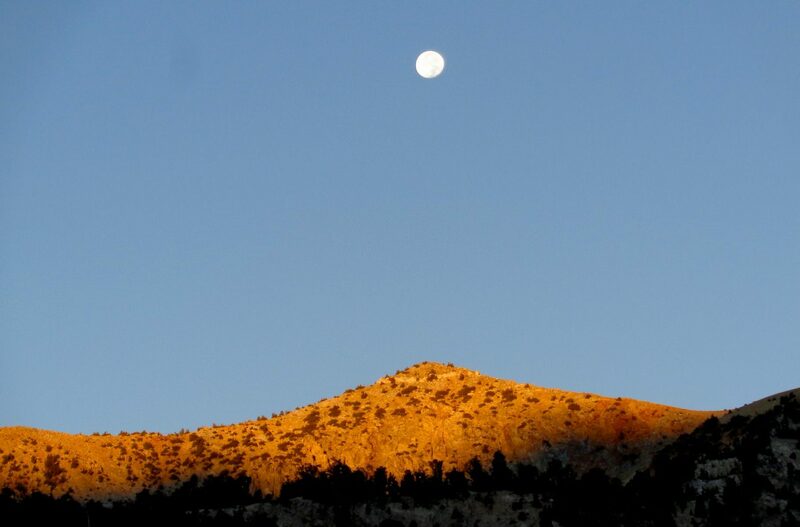 The true summit of Colosseum is the western high point and its elevation is not marked on the USGS map. We had fine weather except for the second day. 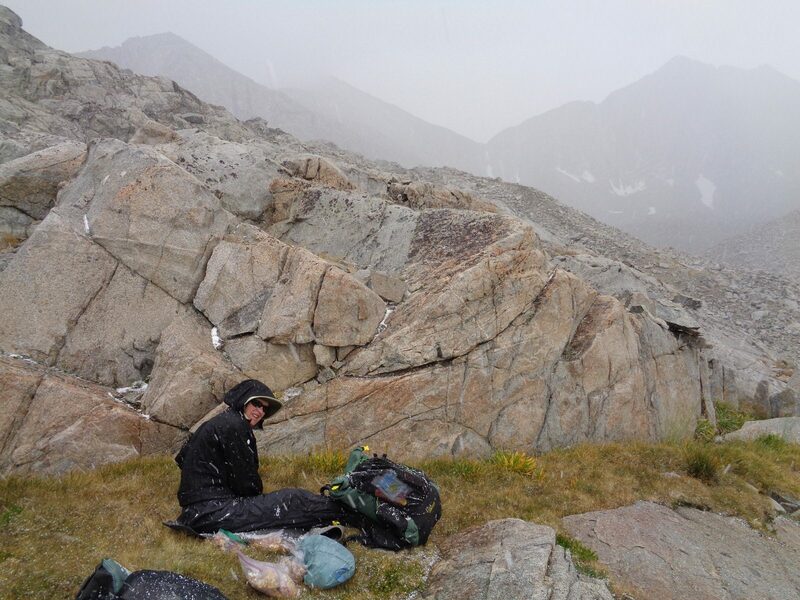 It started snowing during our descent of Mt. Baxter and a surprising amount accumulated. The peak of the storm occurred as we ate lunch. As is usual during September, bugs were not a problem. About thirty years ago, give or take, our family including our folks took pack animals up to Saw Mill Lake below Saw Mill Pass and went on foot from there. I do not recall now if Amy was on this hike or not. Included in our backpack trip was the lake below Window Peak that James references in his description. I agree it is a beautiful lake. I caught a nice trout in the stream that drains that lake. 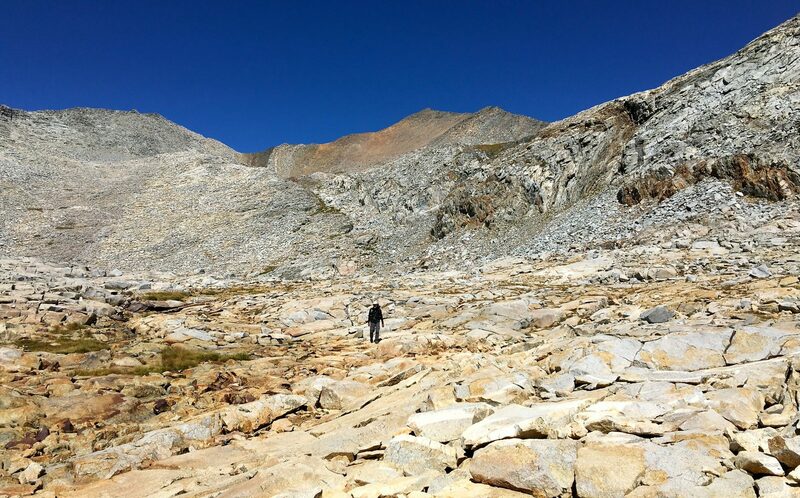 We exited the trip by Baxter Pass, and we found that the trail back down to Owens Valley was not being maintained then either and had had several land slides that we worked around. We camped at about 6,800′ on North Fork Oak Creek not far from the trail head the evening before we exited. Interestingly, even though this trail is not maintained and very infrequently used, we had bears visit us that night. This was a long way from any kind of regularly used trail. In those days we were hanging our food, there were no bear canisters, and luckily we hung our food out of habit. Our trip was much much more modest than the route that Amy and James describe here, but it was still into the gorgeous heart of the Kings Canyon Nat’l Park. 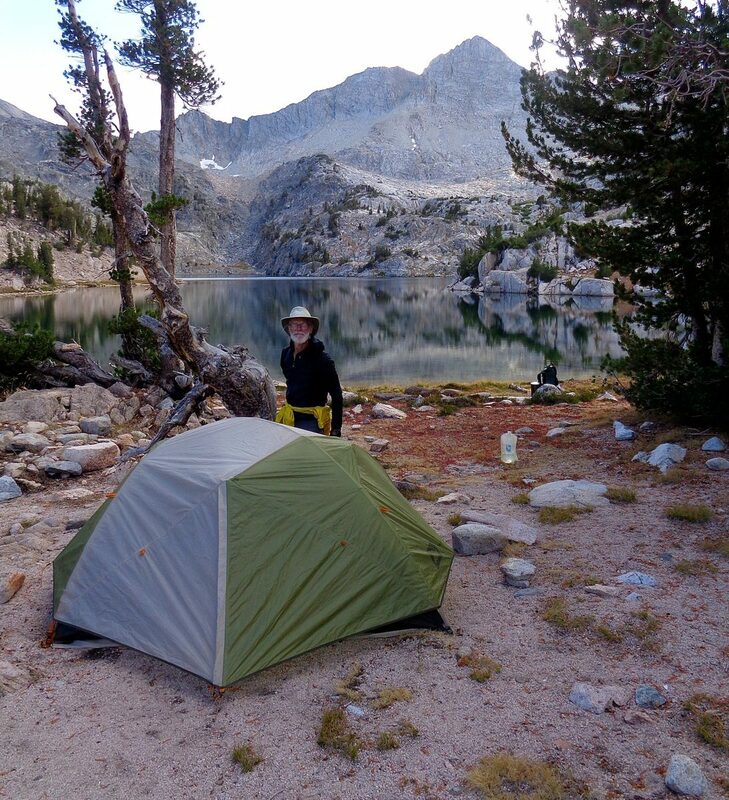 Life doesn’t get any better than backpacking in Kings Canyon/Sequoia and environs.